In the 19th and early 20th centuries Bermuda was known as “The Easter Isle” because of its hugely successful lily farming industry — and the island still commemorates its one-time major cash crop by sending bouquets to Buckingham Palace every year. Governor George Fergusson and Mrs. Fergusson participated in the annual picking of Easter Lilies for Her Majesty the Queen. 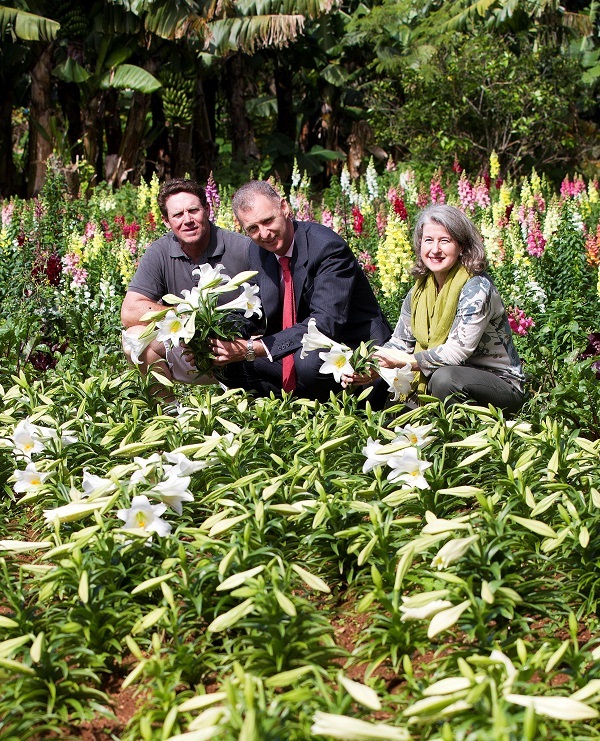 This year’s Easter Lilies were from Windy Bank Farm in Smiths, and the Governor is pictured below with Malcolm Smith, owner of Windy Bank Farm. Government House said that Her Majesty’s Easter Lilies will travel on this evening’s British Airway’s flight to London. Still, in 2013 we are sending Easter Lillies to the Queen. What happened to the photo of one little black girl and one little white girl picking the lillies? I hope Her Majesty enjoys her lillies. If you don’t have anything nice to say, then please don’t say anything, it’s not all about “You”. Thank you Malcolm, the jester is certainly appreciated. It’s refreshing to see that our Traditions are being kept alive. Grandma would be so very proud. Gesture. Malcolm made the gesture. Laverne is the jester. years ago there were Easter lilies everyhere the likes of Amaral Farms Pacheco Farms. Desilva farms and Wadsoms all have sent lillies to the queen, i know of one retired farmer who for 20 years sent lillies to the queen and never got as much as a thank you note! these faremers give thees lillies for FREE and to top it all off the farmer still has to pay the government plant inpection officer to issue a permitt stating the lillies are pest free!!! I have no issue with the Bermudian tradition of sending lillies to the Queen. However, there is no good reason for the English Governor to be involved in this photo op picking flowers for his boss. Surely a photo of Bermudians is more appropriate. WOW…..I think this is so fitting of a Govenor….what else to do in Bermuda other than pick lilies for a Queen who won’t even receive them or whose help throws them away upon receipt. Send the lilies to a sick patient in KEMH to brighten up their day and to cover the nasty smell in that place.